Are you in favour of abolition of compulsory education for six-year-old children and return to compulsory education for seven-year-old children? 1st September was just few days ago. After the reform ‘lowering the age at which children start their school education’ the second group of 6 and 7-year-old children started attending the freshmen classes. And since we are in the ‘pre-election’ mode there are some votes about a reform reestablishing the previous age for starting school education. We are going to use R, Wikipedia and packages: htmltable, ggplot2 and archivist to juxtapose these ideas with demographic data. We will use easily accessible data, that is, birth statistics. 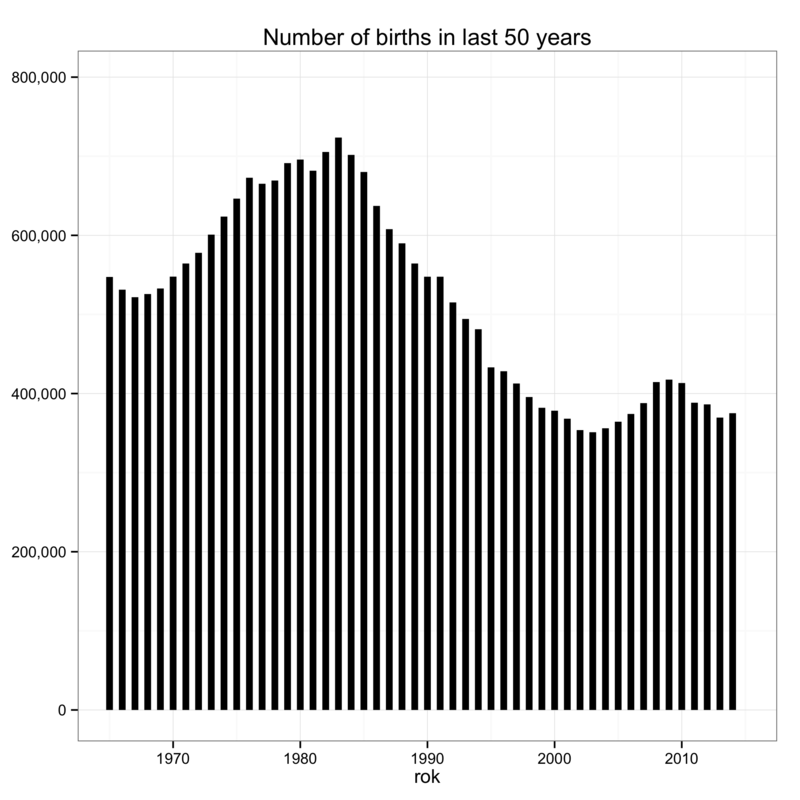 Let’s use the htmltable package to download from Wikipedia birth statistics concerning Poland from the last 50 years. 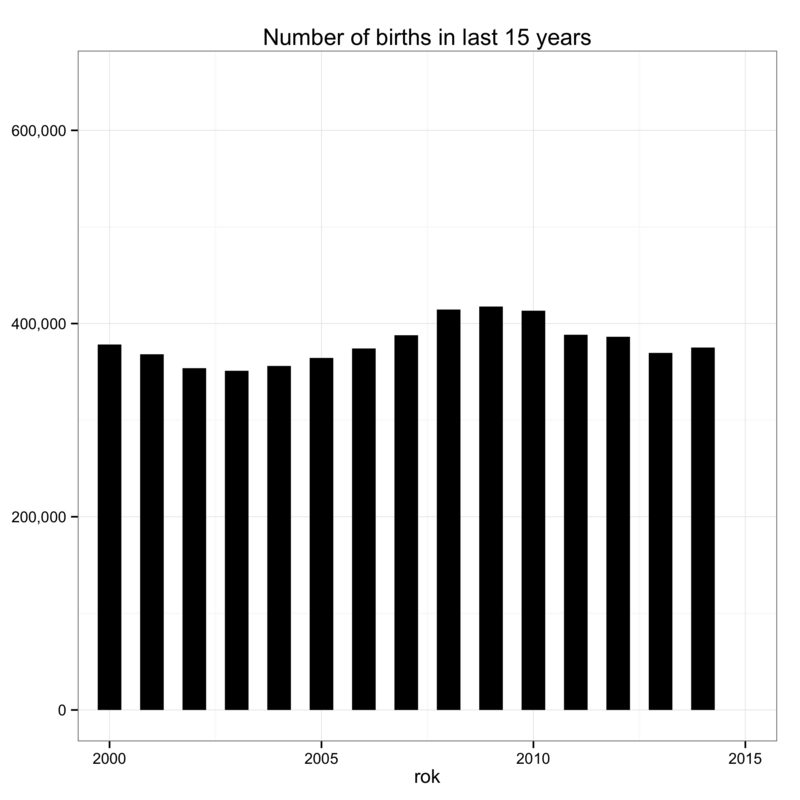 Then let’s use the ggplot package and bar charts to present the birth rate (chart on the right-hand side, click to enlarge). There is a clear decreasing tendency, but some local ‘waves’ are also visible on the chart. After more numerous age cohorts from 1975-1985 more children were then born around 2008. Since we are interested in the ‘present’, we will limit the period to the last 15 years (chart on the right-hand side, click to enlarge). 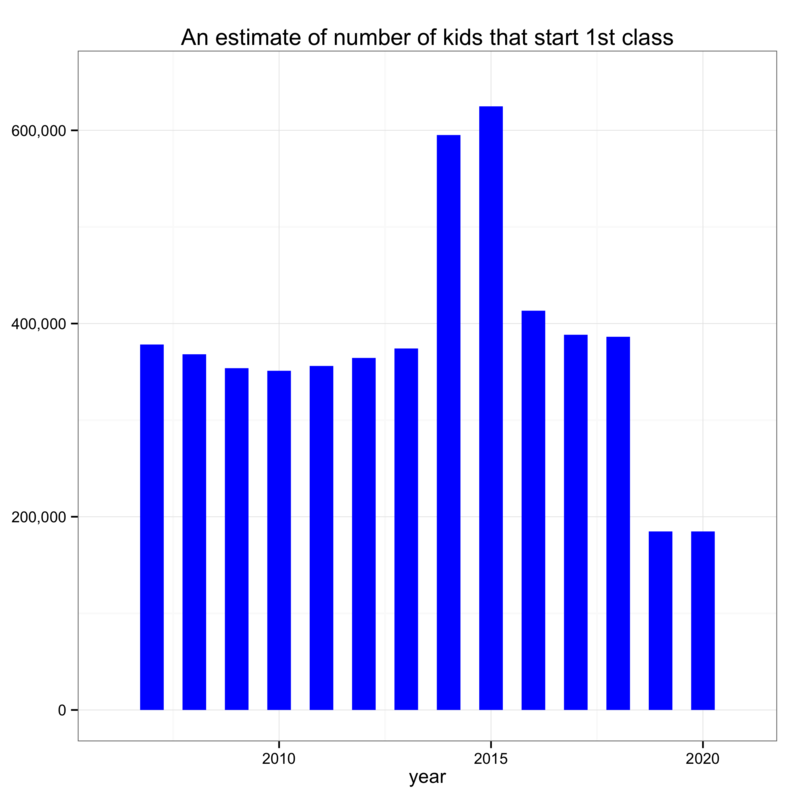 We can easily see that more children were born between 2008-2010. Let us look at this data through the prism of the education reform. If we want to lower the age at which children start school education, we must accumulate x+1 age groups in x years. Which x would you choose and which age groups would you accumulate in that way? Unfortunately (in reality) the accumulation concerned the age groups 2007-2009 – the age groups from the slight demographic boom. The chart on the right-hand side (click to enlarge) presents a theoretical result of such accumulation. Theoretical, because due to certain mortality rate and migration not all of the children born in Poland go to schools in Poland. What is more, for several years the parents of six-year-olds were allowed to decide if they wanted to send their child to school a year sooner. A year before the compulsory lowering of the school age only 20% of parents decided to take that step. 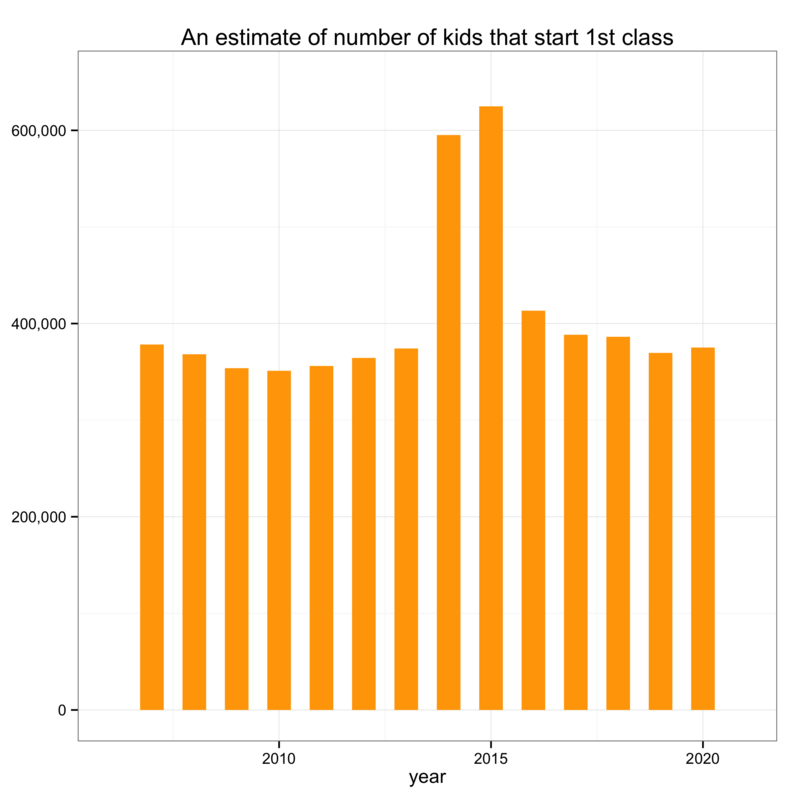 All of that means that the estimations presented here diverge to some extend from the actual number of children who will attend the first year. These numbers are not completely know at the moment as some of them belong to the future. All right then, what about the reestablishing the previous age for starting school education? Let us assume that in the referendum (we know that it will not happen soon, but let’s do a mind exercise) most of the voters will decide that the school age should be increased and the government will follow the majority vote and it will quickly adopt a relevant act. It will mean that now one age group would have to be divided in two. 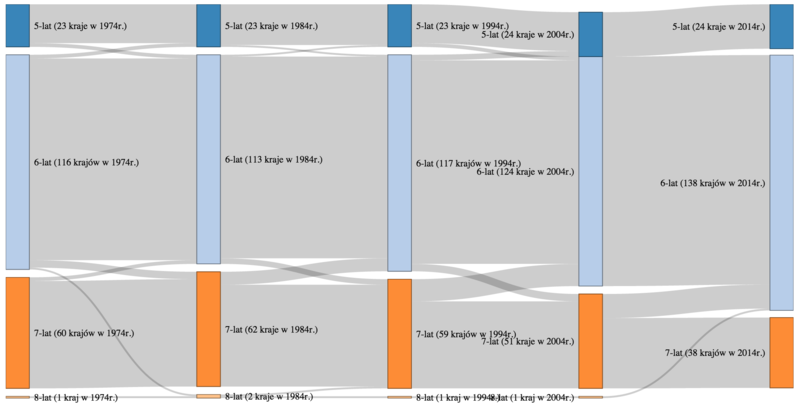 The chart on the right-hand side (click to enlarge) displays a theoretical result of such action (still preserving the same reservation that the estimation is very rough). If we have another reform, it will unfortunately hit a demographic decline. After 6 years of schools almost coming apart at the seams accommodating over 150% of average number of students and working on shifts, suddenly the first year will have 3.3 times less pupils. How this looks like in other countries? Let’s download data from World Bank, data related to changes in the age of entering the primary education and let’s use a great package networkD3 to visualize how different countries behaves. We see the general tendency that more and more countries decide to lower the school starting age to 6.
https://deepsense.ai/wp-content/uploads/2015/09/Are-you-in-favour-of-abolition-of-compulsory-education-for-six-year-old-children-and-return-to-compulsory-education-for-seven-year-old-children.jpg 337 1140 Przemyslaw Biecek https://deepsense.ai/wp-content/uploads/2017/07/1-300x71.png Przemyslaw Biecek2015-09-10 11:28:232018-06-26 07:25:11Are you in favour of abolition of compulsory education for six-year-old children and return to compulsory education for seven-year-old children?